Peters Projects is pleased to present a solo exhibition entitled, I Think It Goes Like This, of installation artworks by Alaskan artist, Nicholas Galanin. The exhibition will be on view at Peters Projects, 1011 Paseo De Peralta, Santa Fe from July 7 – September 2. There will be a special gallery reception Friday, August 18, 5-7pm, during the SWAIA Indian Market week in Santa Fe, NM. The artist will be in attendance. Galanin is a multi-disciplinary artist and musician of mixed Tlingit/Aleut and non-Native ancestry. His work often explores a dialogue of change and identity between Native and non-Native communities. 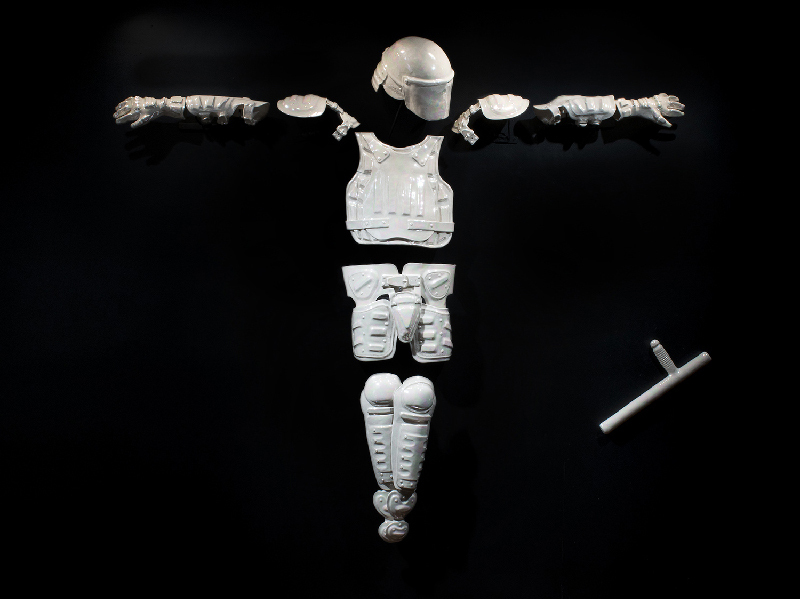 He addresses the result of violence in societies around the world in an iconoclastic nature. The artist challenges the viewer to consider how suppression from violence destroys religion and spiritualism. The artwork presented at Peters Projects is directed to the exact institutions that are intended to protect and support society. Each of the three installation artworks re-assemble and re-contextualize the Christian cross, the Asian Samurai (bushi). 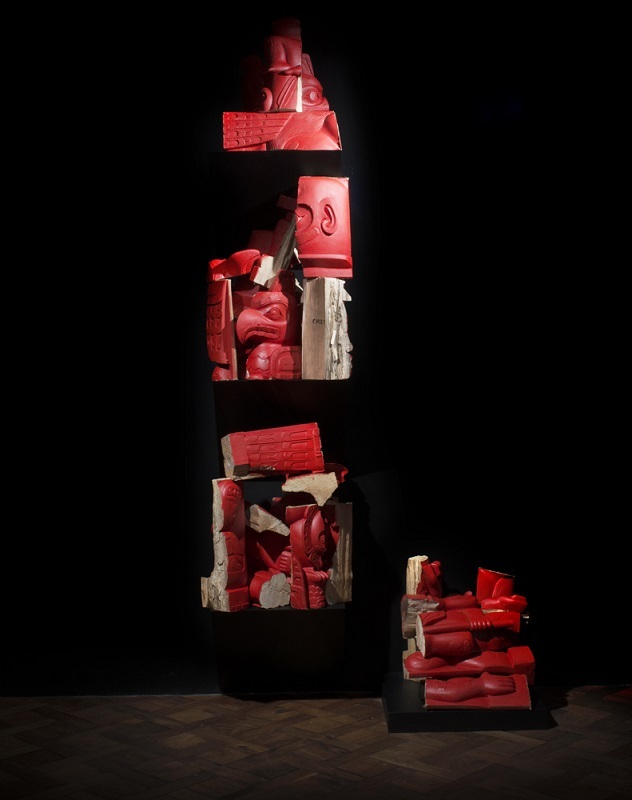 (God Complex was first shown at the Kurumaya Museum, Japan), and the artist’s interpretation of cultural icons such as a totem pole. I Think It Goes Like This and Imaginary Indian depict a mass-produced painted totem pole which has been cut up. These totem poles are manufactured in Indonesia and sold in gift shops throughout Sitka, Alaska. Born in Sitka, Alaska, Nicholas Galanin has struck an intriguing balance between his origins and the course of his practice. Having trained extensively in ‘traditional’ as well as ‘contemporary’ approaches to art, he pursues them both in parallel paths. His bodies of work simultaneously preserve his culture and explore new perceptual territory. Galanin studied at the London Guildhall University, where he received a Bachelor’s of Fine Arts with honors in Jewelry Design and Silversmithing at Massey University in New Zealand earning a Master’s degree in Indigenous Visual Arts. Valuing his culture as highly as his individuality, Galanin has created an unusual path for himself. He deftly navigates “the politics of cultural representation”, as he balances both ends of the aesthetic spectrum. With a fiercely independent spirit, Galanin has found the best of both worlds and has given them back to his audience in stunning form.